Time and Change is a series at BuckeyeNation where we chat with former Ohio State athletes. Tom Tupa was an All-America punter and was the starting quarterback during his senior season in 1987, Earle Bruce's final year as head coach. After being a backup quarterback for three seasons behind Mike Tomczak and Jim Karsatos at Ohio State, Tupa threw for 1,786 yards and 12 touchdowns his senior season. He was selected to the 1988 Hula Bowl. Tupa, now 46, was a third-round pick in the 1988 NFL Draft, selected by the Phoenix Cardinals with the No. 68 pick. He averaged 43.4 yards per punt, which ranks 36th in NFL history, before retiring in 2006. He won a Super Bowl with the Tampa Bay Buccaneers after the 2002 season. 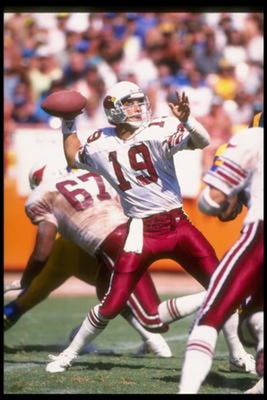 Tom Tupa had a 16-year NFL career as a quarterback and punter and started 11 games at quarterback for the Phoenix Cardinals in 1991. A 1999 All-Pro selection, he was a backup quarterback in the NFL and became known as "Two-Point Tupa" for his three two-point conversions in 1994, when the rule was added to the NFL. He scored the first two-pointer in NFL history as a member of the Cleveland Browns. Tupa is the recreation director for the city of Brecksville, Ohio, where he led the Brecksville-Broadview Heights Bees football team to a state title in 1983. He is also the offensive coordinator for the Bees' varsity squad, where his sons Tommy and Tim play. His youngest son, Tyler, will be a freshman this year, and his daughter Emma will be a seventh-grader. His son, Tommy Tupa, committed to Miami (Ohio) in May. The RedHawks expect him to be their future quarterback. BuckeyeNation caught up with Tupa recently and asked him about fatherhood, coaching and his time at Ohio State. BN: Do you miss your playing days? Tupa: I do a little bit as far as hanging out with the guys and game days and things like that. To be honest with you, though, I enjoy what I'm doing now. I'm coaching my boys and my daughter, actually. It's just a great situation to coach and watch them and be a part of what they're going through. It's been great so far. BN: What pieces of advice from Earle Bruce have you taken and applied to your everyday life? Tupa: It's just to go out there and fight for what you want. To compete for the things in your life and what you believe in and not to back down when you believe in them. BN: What is your fondest memory of Ohio State? Tupa: To pick one is tough. I have a couple of great memories. Obviously, making it to the first Rose Bowl my freshman year, that was a special time. Beating Michigan my senior year. It was Earle's last game up there. That was a special game for us with the circumstances surrounding that whole week [Bruce was fired early in the week]. There are a lot of moments and games and what not, but those are the ones that stand out. BN: Is it tough to sit back and not overstep your bounds when you're giving advice to Tim and Tommy as members of the football team? Tupa: It's tough at times. You're probably always tougher on your kids than any other kids, so they get it more than anyone else. I think they understand that it's just part of being a coach's kid. When we're at home, we try to let it go. It's over with, it's done with. It's on to the next thing. It's tough because I'm looking for them to do the best they can and want to see them be successful. I think they know I'm just looking for what is the best for them. BN: What does it mean to coach at your high school alma mater? Tupa: It's great. I'm back in my hometown. We've had a few successful years back-to-back. We've got the program on the right trail again. The kids have bought into what we want to do. We've had a lot of city supporters and people are anxious to see us play. We're not a boring team. People like to see what we're going to do out there. We keep them on the edge of their seats from play to play. It's fun. Tupa: I'm going to do the coaching thing for the foreseeable future. We'll see how long I do this, but I enjoy it. I have fun and we're winning and that makes it all that much better. For now, I'll stay the course, coach the kids and see where it leads us.